Be patient, training a Cocker Spaniel to pee outside may take up to six months. With sweet eyes and long floppy ears, Cocker Spaniels will capture your heart. Cuteness aside though, you still don't want them to pee in your house. With consistency you can train them to pee outside and save your floors. Luckily, like most dogs, Cocker Spaniels live to please their owner. Choose an outside location that is free from too many distractions, such as other animals or children playing. Bring her outside as soon as she wakes up, after eating and before going to bed at night. Speak a key phrase, such as “potty time” so she can learn to associate the action with the words. Young pups need to urinate often. As she ages, the intervals between her “potty times” will increase and become more predictable. Stand away a safe distance, giving her room to sniff around and find the perfect location to relieve herself. As cute as she is, don’t give in to the urge to play with her because she must learn this is time for doing her business. Lavish her with praise and love when she pees outside. 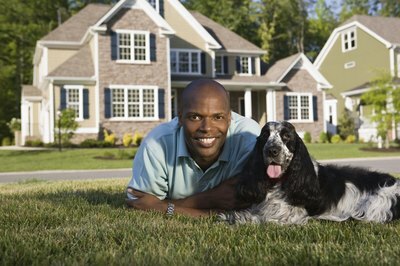 Like all dogs, Cocker Spaniels thrive on their owner’s approval and seeing you happy will reinforce positive behavior. If the pup is unable to pee outside after 5 to 10 minutes, don’t scold her, simply take her back inside and try again 10 minutes later. Clean up indoor accidents as soon as possible with an enzyme cleaner formulated for urine elimination. Instinct tells a dog that if they can smell their own urine in a location, then that is their bathroom. Be certain to follow the manufacturer’s instructions to remove as much of the odor as possible and discourage future indoor accidents. Use a dog crate as a training aid for times when you must be away from your Cocker Spaniel. Make sure it is a comfortable, welcoming environment. She will do her best not to have an accident inside of her crate. However, use the crate sparingly and never as a form of punishment.Take her outside to pee immediately upon your return. Use your pup's age as a guideline for peeing outside. For example, a two-month-old puppy will need to relieve herself every two hours, while a four-month-old puppy usually can wait four hours. Dog treats also can be used as a reward when the Cocker Spaniel pees outside. Do not overfeed your dog. Follow feeding guidelines recommended by your vet. Always keep fresh water available. Do not spank your dog for having accidents inside or failing to pee outside. She will not understand your anger. Do not leave your Cocker Spaniel inside all day and expect her to be able to hold her urine. This can cause her to get a bladder infection. Ask a trusted friend to help take her outside when you are gone for extended periods of time.